I’m not a sports person. I don’t play sports. I don’t run, I don’t work out, I dread football season because I don’t want to hear about it. I don’t watch sports….EXCEPT Ice Hockey. Bill also loves Ice Hockey…. 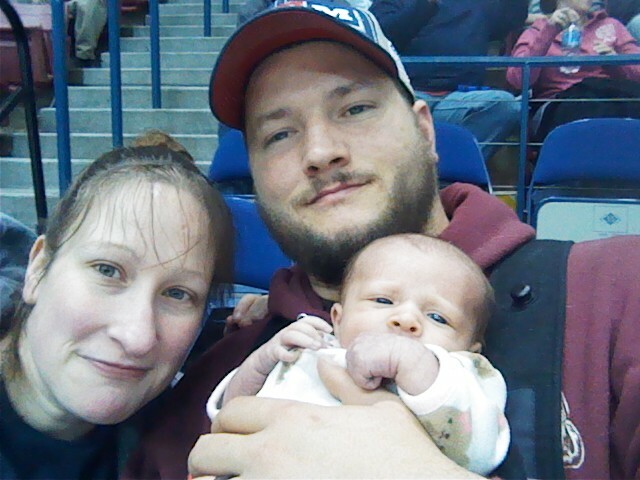 So naturally, we couldn’t wait to bring Talia to her first game. The best part? 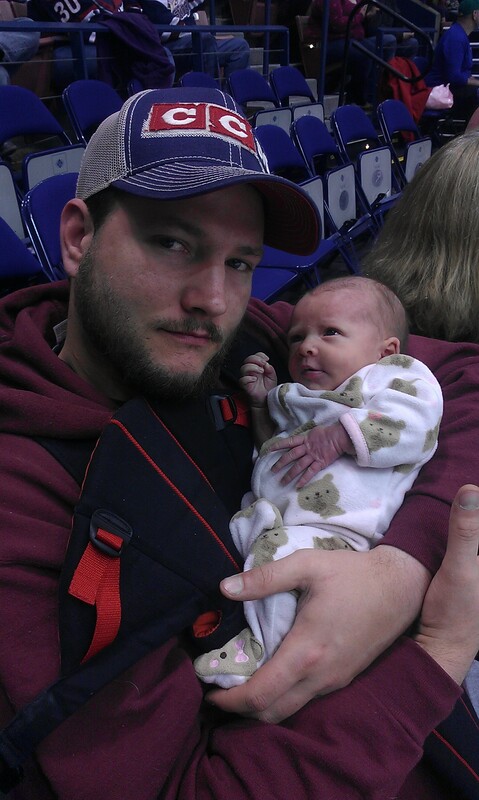 The Stingrays made history the night we brought her (Friday)…they also haven’t lost a game since she was born! I think that makes her a good luck charm…also, if we weren’t moving over the summer, I would say they need to give us season tickets to keep the momentum next year. They won their 14th straight game that night! Since then they’ve won two more! We bought special ear protection for her, but tough girl wanted nothing to do with it. 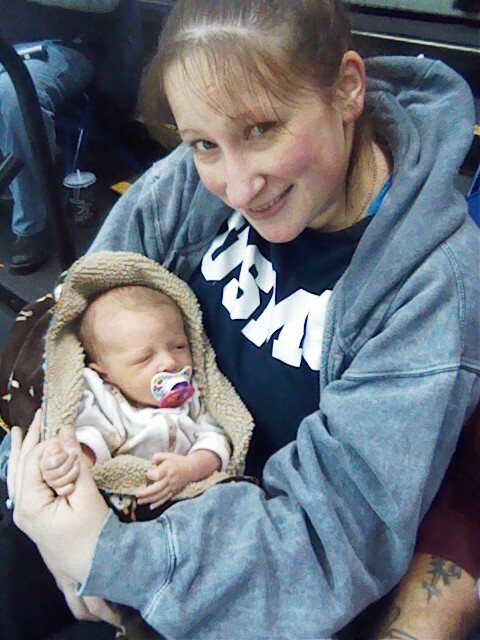 She didn’t seem upset at any of the noise though, even when they scored and the crowd would go nuts. She slept through most of it actually. I just love this picture of Bill holding her. He’s just such a great daddy! Of course I needed one with her, too. I always look so silly trying to do “selfies.” Ugh! 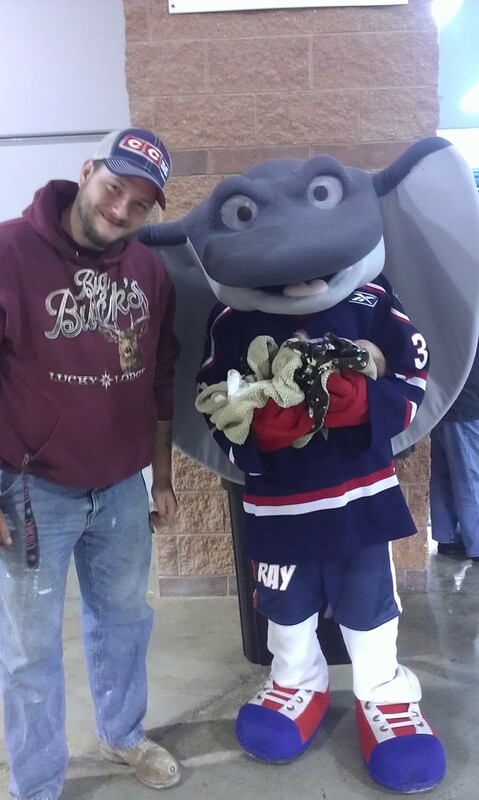 Yes, I freaked out a bit when Bill handed her over to the mascot (who willingly took her). I also started baking again last week. I had to make 45 Mudd Pies. Let me tell you, it’s great to be back where I belong….IN THE KITCHEN!!! This is our signature pie. 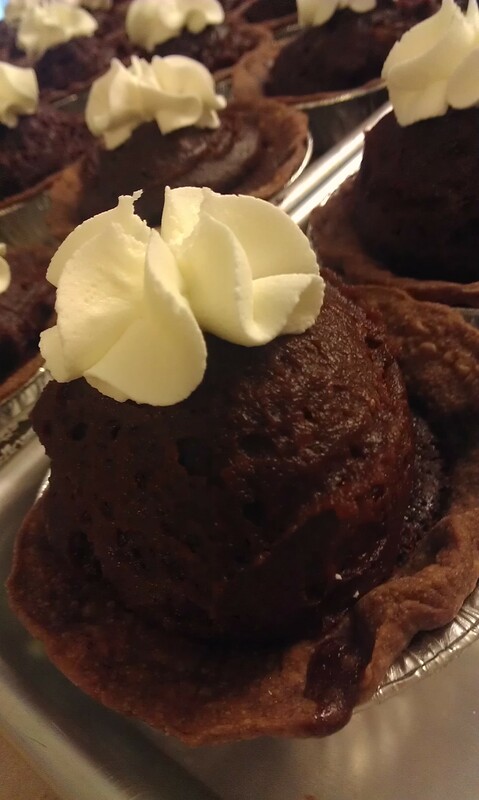 It’s a chocolate crust with a soft, baked chocolate bottom, topped with pudding and whipped cream. We boxed them up for bridal shower favors. It was so much fun, and I can’t wait to get back to baking full time. In the meantime, the first half of the semester is now over. Since they split the semesters in half, I’m actually done with 3 classes this semester already. I pulled 2 A’s and 1 C. The C was for a class I HATED because of the content and format, so I’m not too upset. Also, I did manage 2 A’s, so I’ll focus on the positive. I also had a baby this semester. I think I get extra points there. Tomorrow we have an appointment at the pediatrician for Talia and then I head over to school to submit my application for graduation. I’m not getting a degree, but a Professional Writing Certificate. Who knows when I will get around to taking the math and lab science (both require I go on campus) so I’ll take my certificate! I still get to walk in graduation and it’s something I’ve really worked for, so I’m excited! I also missed my high school graduation, so I’m due for getting a cap and gown!!! With the rest of this spring break I’m working on my sample chapter for my book “Literary Crazy” about mental illness and our most beloved writers. It should be done before we go back to school on Thursday. Talia is a DREAM baby, so I’m getting a lot done!